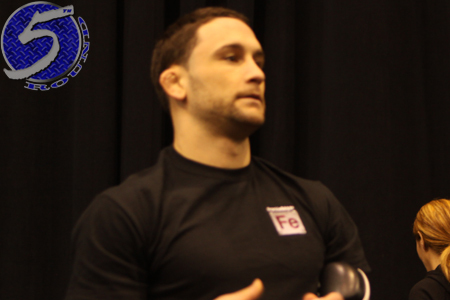 Frankie Edgar (pictured) completed the trifecta against BJ Penn at “The Ultimate Fighter 19 Finale.” The only difference this time compared to Edgar’s two previous unanimous decision wins over Penn was that he finished “The Prodigy” in their trilogy. While Edgar was happy to collect the win, he admitted the victory was “bittersweet” and said he felt “bad” for inflicting the punishment he did on Sunday. Penn was a bloody mess when the assault was finally brought to an end. Penn called it a career after the lopsided defeat. Edgar, meanwhile, proved that he’s still a force to be reckoned with. TUFC 19 Finale took place inside Mandalay Bay Events Center in Las Vegas, Nevada.